A colleague loaned me this bookrecently and I found it an easy read with some good concepts. 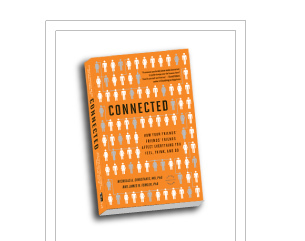 Surprisingly, it is not just about online connectedness but broader concepts of connectedness in life including everything from bucket brigades to sexually transmitted diseases. The theory includes key terms, such as, contagion, connection, homophilia (the tendency to associate with people who resemble ourselves). The contagion concept is particularly significant as it relates to health because of recent research showing that obesity is “contagious” in the sense that if your friends are obese, you are likely to be. It made me think of the app ShapeUpandGo and other wellness apps that encourage the use of teams and competitions/games to encourage connectedness on the path to wellness. One of the more engaging chapters is on being Hyperconnected with a major example from World of Warcraft and how new features of the game had unexpected consequences that soon careened out of control. This is the unpredictability of the online world were rules are yet to written. In addition to the book, the website has the usually videos and links to reviews but also a book club guide and a section called Touchgraph which includes some of the network diagrams which are in the book and slide sets relating concepts presented in the book. The book reminds me of Clay Shirky’s work, Here Comes Everybody and The Wealth of Networks although not in the depth of that work. In healthcare, we do need to understand how connectedness affects health. The book only covers this with a few of the many case studies. Perhaps another author will take up the task of expanding on this concept and suggest how connectedness can promote health and prevent or delay disease. Also, the concept of connectedness through social media needs more study in terms of how it can impact copying with chronic and live threatening disease. The connectedness of healthcare providers can have a significant impact on promoting best practices, patient safety and research. More on this in future posts.